All prices include shipping fees. The larger the quantity, the lower the price per unit. Our Leaflet Pack is a better value than four assorted leaflets. Click the Add to Cart button so you can specify a quantity or amount (USD). In the cart, click the Check out with PayPal button to pay with PayPal, a debit or credit card. CLA℠ neither endorses nor supports any product or enterprise. literature@clutterersanonymous.org appears on all receipts. We don’t automatically add customers to our email list. To subscribe, click here. Note: Mail orders take longer to fill than online orders. Remember to set the Ship to Country and click Update Cart on the “Your Shopping Cart” page. This leaflet contains some of the core literature used in Clutterers Anonymous℠: Preamble, How Do I Know If I Am a Clutterer?, Tools of Recovery, The 12 Steps, and The 12 Traditions. This leaflet provides strategies towards healing mind clutter. Excerpt: “Often our minds are filled with trivia; we fail to recognize what is really important. We cannot find serenity because our thought processes are clogged with self-defeating, irrelevant ideas. Or we are overwhelmed by endless distractions. This leaflet gives strategies on working the Steps, healing grudges, and rewards of recovery. Excerpt: “Just as clutter consumes our physical space, resentment consumes our minds. Just as we can’t relinquish unneeded items, we’re unable to forgive injustices. This leaflet explains how clutter prevents us from reaching our full potential until we achieve clarity. Excerpt: “For much of our lives, the burden of clutter has kept us from using our God-given talents. Useless objects, non-supportive relationships, and busywork have eaten up our time and energy. The clutter fog of unfinished thoughts, trivia, and worry has made us forget our early dreams, hopes, and visions. This leaflet identifies ways to convert your nightmare into a nurturing home. Excerpt: “Home is a physical place, but it can also be a spiritual one—a feeling of being at ease with ourselves no matter where we are. If we lack self-acceptance, the most beautiful house is not a true home. “When we think of redoing our homes, we often harbor unrealistic ideas. Comparing our home to showplaces makes us feel hopeless and leads to paralysis. How can we change our booby-trapped, clutter-filled house into a nurturing home? How can we transform our attitude of shame and resentment toward our home to one of love and gratitude? The purpose of the leaflet is to address physical, emotional, and spiritual cluttering and hoarding. We do this by listing behaviors and habits that affect our cluttering so we may better track our progress and understand how these behaviors and habits help or hinder us in our recovery. This leaflet contains What Is Clutter? and discusses the Steps, as they specifically apply in addressing clutter. This leaflet discusses divine order, time management, and regaining a spiritual connection. Excerpt: “All clutter wastes time. Unnecessary objects and unhealthy relationships take maintenance. Here, the focus is time clutter, which is caused by unfulfilled emotional and spiritual needs. “Because we believed our problem was poor time management, many of us consulted experts. We hoped they’d show us how we could gain more time by becoming more efficient, but this proved counterproductive. Organizing, when used rightly, is valuable; however, our self-will only encouraged our greed and expanded our time clutter. We filled the time saved with even more activities, and the result was less time. This leaflet has a questionnaire on How Do I Know If I Am a Clutterer? It also explains how Clutterers Anonymous got started and what it has to offer you. Your contribution pays for CLA WSO literature reprinting, website maintenance, webmaster, phones, printing of meeting lists, mail, postage, etc. Thanks for your interest in furthering various CLA WSO projects. Fill in Group Making Donation. E.g., "Tue. Phone Meeting" or "Thu. Fresno, CA." When the "Your Shopping Cart" page appears, adjust the dollar amount. Help cover CLArity production, publishing, printing, paper, distribution costs. Thanks for your support of our CLArity newsletter. When the “Your Shopping Cart” page appears, adjust the dollar amount. Click the thumbnail to read a sample edition from spring 2014. We hope this sample gives you an idea about our informative and interesting quarterly newsletter. 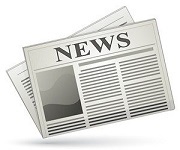 eCLArity, the electronic version of the CLArity newsletter, can be purchased separately. eCLArity is the electronic version of the CLArity newsletter. CLArity can be purchased separately. 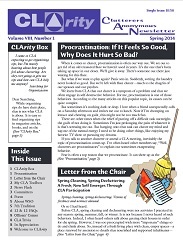 CLArity is CLA's printed quarterly newsletter. 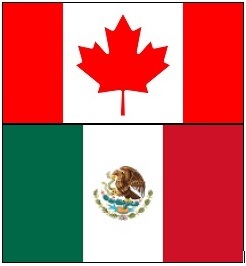 New issues are released in March, June, September, and December. Articles from the Spring 2007 through the Holiday 2016 issues of CLArity, CLA's printed quarterly newsletter. CLA WSO is a 501(c)3 nonprofit organization.